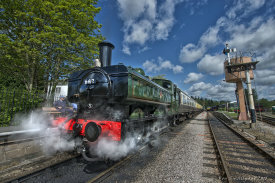 Just half an hour away, the South Devon Railway is one of the West Country’s best loved tourist attractions and is the longest established steam railway in the region. The line runs along the stunning valley of the Dart between Buckfastleigh, where there’s plenty of car parking, and Totnes. Far more than a steam train ride, it offers a wonderful all weather attraction for families and people of all ages. Take a look at the website for time tables.